I was really in the mood for BBQ today. Oh well, maybe tomorrow. J wanted a salad but didn’t know what kind of salad she wanted. 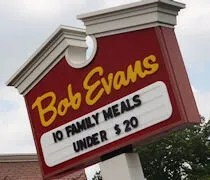 The only lettuce we had in the house probably isn’t edible anymore so I pulled up the menu for Bob Evans. When we lived in Lansing, I know she did carry-out from there a few times and she did so because she liked a salad. 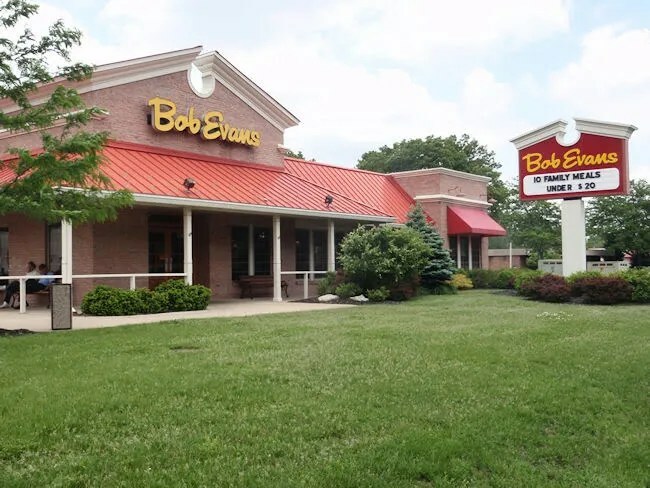 There are two Bob Evans locations in Kalamazoo. One is right off the Interstate in Portage. The other is not far from US 131 on Stadium Drive. That was the one I ordered from. The great thing about Bob Evans is that they do online ordering. I always like places that let me order without actually having to use a phone. I handed the computer to J first so she could find the salad she wanted. I had been wanting to try their new Big Farm Burgers. It was just a matter of choosing which one. After deciding, she handed the computer back to me and I put the order in. It was going to take about twenty minutes and the restaurant is only about ten minutes away. I decided to get there early because I’d rather wait on it than pick it up cold. Whenever I do pick up from these casual chains, I usually end up eating a cold burger because I wait until the time I’m actually told to pick the meal up and it’s usually been sitting there for a few minutes. I parked on the side of the building and entered through the carry-out door. It really doesn’t matter how you enter because they all lead to the same cash register near the kitchen. When you come in through the side, you’re just a little bit closer. I gave the guy who acknowledged me my name and paid cash for the food. The bill was a little over $17 with no drinks. Since we were doing carry-out, I was just going to stop at the BP on my way home because I’d rather have a Pepsi and Bob Evans serves Coke. The meal had just come out of the kitchen but wasn’t bagged up yet. Another lady started bagging it up and both people started apologizing. There was really no need because I was early and I really didn’t have to wait that long. Still, they offered me a free iced tea since I had to wait, but I declined because, again, it wasn’t necessary. It was a nice gesture and definitely something I will remember. When I got home, J was waiting for her lunch. I pulled the salad out of the bag and handed it to her along with the three packets of dressing they gave me. 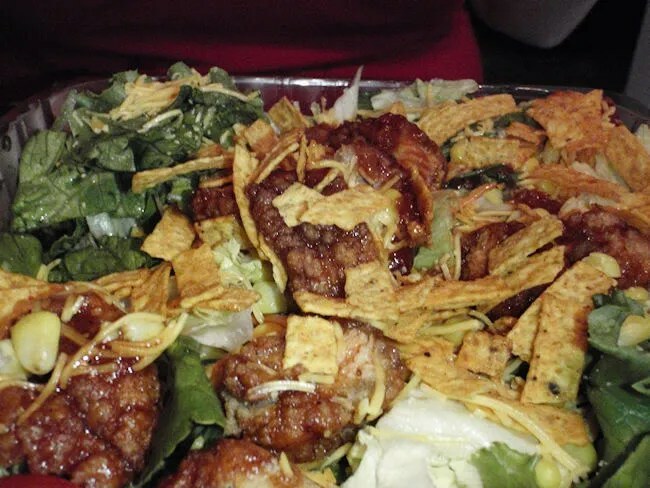 She ordered the Wildfire Chicken Salad which comes with fried chicken, BBQ tortilla strips, corn, scallions, and cheddar cheese. The dressing is called Wildfire Ranch dressing and the salad comes with choice of bread. She got the Banana Nut Bread which was two slices of bread that came with several small tubs of butter. I opted to order the “Savor-size” which was more than enough. J was surprised when I told her I ordered the small one because I don’t think she even would have noticed. She said the dressing was a little spicy, but other than that, she really liked it. It was just what she needed for the salad craving she was having. I ordered the Smokehouse Burger. 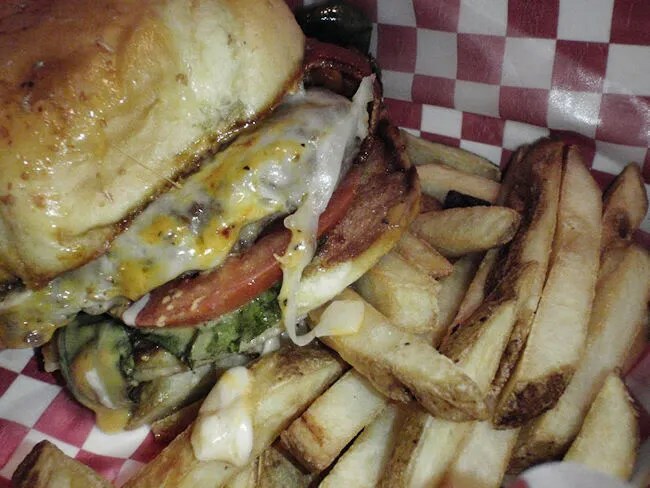 The sandwich is a half pound 100% Angus patty with Monterey-Jack cheese, Memphis spiced rubbed bacon, lettuce, tomato, onion petals, and a Spicy Chipotle Sauce on a wheat-dusted brioche bun. I have really been looking forward to trying one of these burgers for a while. The advertisements make them look so damn good. I don’t know if they serve them like this in the restaurant but the burger came wrapped in foil which made it a little bit soggy. The sandwich was put in the foil still really hot so the steam continued to cook everything including the lettuce, tomato. I took the lettuce and tomato off anyway but the bun started falling apart on me. Flavor wise, the sandwich was really good I just wish the bun would have held up a little bit better. The sandwich came with skin on fries which also suffered from the same sogginess as the burger. Still, really tasty and something I would order again in the future. Bob Evans worked for what we needed it for today. We’ve always had pretty good experiences at the place and it will definitely be put at the top of our casual dining carry-out list just because of the online ordering feature. Your planning has to improve, sir. You talk about how you usually get cold burgers, and then a couple lines later you say you make an additional stop off to get Pepsi because they serve Coke. Maybe getting Pepsi first will help you out in terms of making the food you order more what it should be when sent out. you make a good point..but I did think about that. If you’re familiar with that area of Stadium Drive, there’s only one gas station anywhere near the Bob Evans…and it’s on the same side of the road at the very busy intersection of Stadium and Drake. I would have had to cross traffic to get back going in the right direction and there are times when it’s really hard to take a right out of that gas station. Also, if you had read carefully, I never complained about temperature of the food. My sandwich was still plenty warm when I ate it. I complained about the foil wrapping that continued to steam the sandwich which made the bun and toppings soggy. Time to mark this one CLOSED. It seems yesterday (Saturday, May 16) may have been their last day of business.